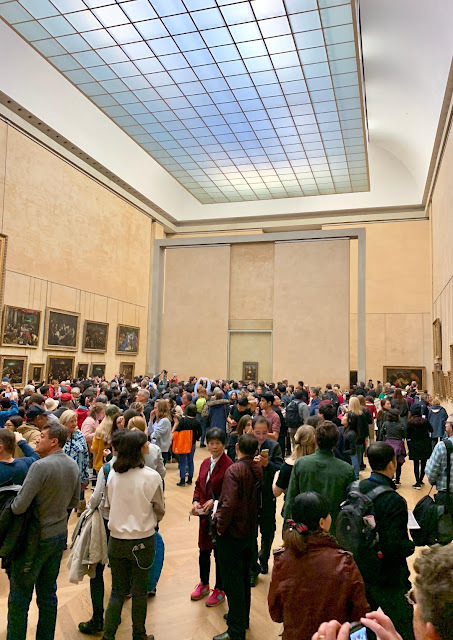 The Mona Lisa, known as Monna Lisa or La Gioconda in Italian and La Joconde in French, has been hanging in the Louvre museum in Paris since 1797. Believed to have been painted between 1503 and 1506, it's been described as "the best known, the most visited, the most written about, the most sung about, the most parodied work of art in the world". 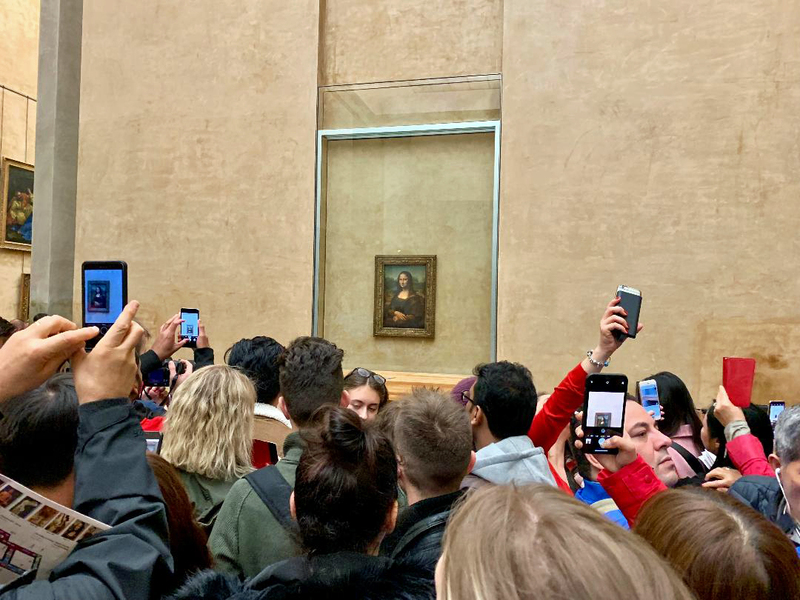 It's also one of the most valuable paintings in the world, having an insurance valuation worth nearly $820 million dollars in 2018. When we located the room the Mona Lisa was supposed to be in, I wasn't even sure we were in the right place. I didn't see anything. The room was crowded and the painting didn't jump out at me as I expected it would. I actually thought it would have its own area, with no other paintings around. People weren't lined up to see her, they were just sort of milling about. Then I spotted her on the far wall. Once I knew where she was, I made my way to the front to get as close as I could. The painting was so much smaller than I expected. I wanted to get as close as I could. I'd heard it was a small painting, but I wasn't prepared for its size. It's less than three feet high by two feet wide. Smaller than a poster! I squeeze my way in and got right up to the barrier in front. No one can get closer than a few feet. There was a guy in front of me who didn't move for a very long time. A young guy, he just kept looking at her. And everyone had their phones out. 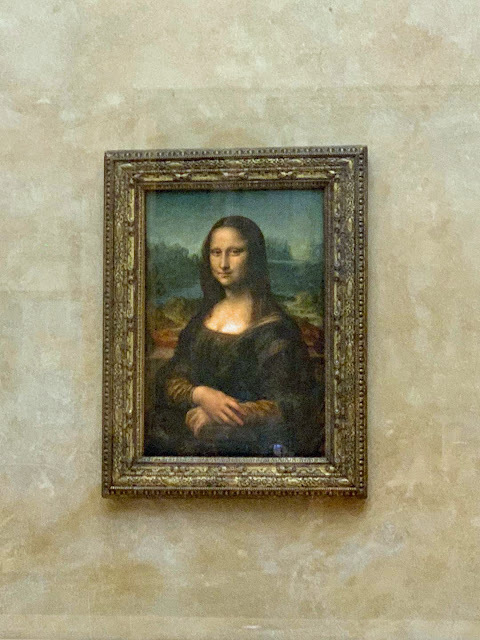 According to Wikipedia, "The title of the painting, which is known in English as Mona Lisa, comes from a description by Renaissance art historian Giorgio Vasari, who wrote, "Leonardo undertook to paint, for Francesco del Giocondo, the portrait of Mona Lisa, his wife." Mona in Italian is a polite form of address originating as "ma donna" – similar to "Ma’am", "Madam", or "my lady" in English. 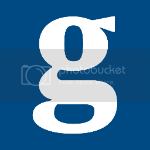 This became "madonna", and its contraction "mona". The title of the painting, though traditionally spelled "Mona" (as used by Vasari), is also commonly spelled in modern Italian as Monna Lisa ("mona" being a vulgarity in some Italian dialects), but this is rare in English. 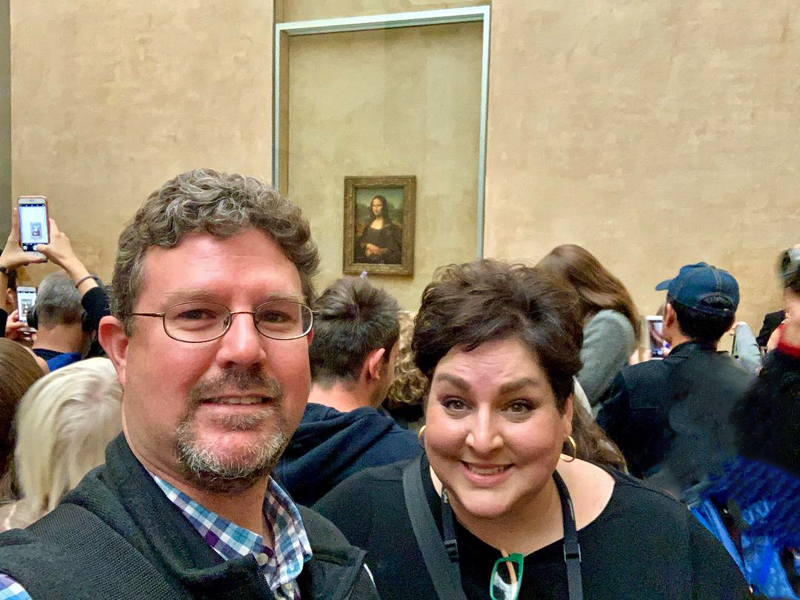 Since we're in the age of Instagram and Facebook and Twitter and well, cell phones, we had to get a selfie of us with the painting. Proof we were really there, in the same room as a masterpiece. And who says that art and selfies can't mix? It's really quite amazing to see a work of art so famous, one that we've known about our entire lives, one that's known all over the world. Even though there are many famous pieces of art in this museum and others, when you get to see them, in person, it just feels special. I've never had a work of art that I had to see. But since we were going to be in Paris, I knew I had to see this one. Prior to the trip, I never thought about seeing it, never talked about seeing it, never put it on any kind of list, let alone a bucket list. But now that I've been there, I think I'm going to have to make a list just so I can check this off. I can now say I've seen the most famous smile.